That’s what a senior IT administrator at a Global 500 insurance company recently said as part of our recently conducted TechValidate survey of our customers. With thousands of network printers, dozens of print servers and scores of remote sites, the company thought relying on print servers was the only option. In a very short period of time—less than 5 days, we were able to fully install our solution, resulting in 400% ROI and a payback period of less than six months. 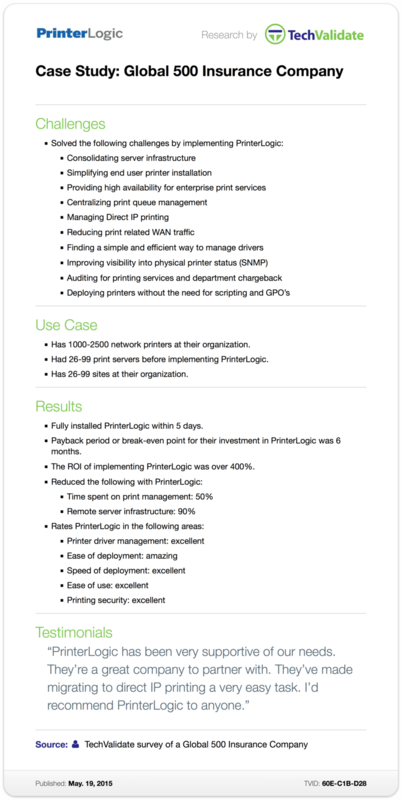 In addition, the company was able to reduce their remote infrastructure by 90% and time spent on print management by half. Before PrinterLogic, simple Centralized Print Management and printer driver management was next to impossible. It was accepted that print servers, while complex, expensive and hard to manage, were the only option. Hundreds of our customer are experiencing the joy of eliminating print servers and converting to centrally managed direct IP printing environment. It’s the reason we have Net Promoter Score of +66 and a 97 percent customer retention rate. We look forward to continuing to serve our customers with current features: print audit, pull printing, secure print, Citrix printing and much more, as well as our upcoming mobile printing solution that will include email to print functionality.